The 2019 Jeep Compass is an outstanding SUV that delivers the legendary Jeep performance, best-in-class 4x4 off-road capability, incredible fuel economy, and the latest technology. It is a truly fantastic SUV that has earned a legion of fans over the past few years because it provides a level of versatility that is unseen in the competition. Continue reading if you would like to learn more about the excellent new 2019 Jeep Compass! What are the new features for the 2019 model year? Jeep has introduced many great appearance options for 2019, including a new Sting Grey exterior paint color, 17-inch Trailhawk wheel finish, and a Premium Lighting Group. Sport and Latitude models have gained a standard 7-inch Uconnect radio, and the Advanced Safety Group Package now includes adaptive cruise control technology. The Jeep Compass Sport model is now available with the Upland special edition, which adds 17-inch Trailhawk wheels, a front suspension skid plate, front Trailhawk fascia with Matte Black tow hooks, Trailhawk all-weather mats, Gloss Black roof, bright chrome exhaust tip, fog lamp bezels and badges, Gloss Black grille with black rings, and silver anodized interior accents. The new High Altitude Appearance Package, which is available with the Limited model, offers luxury features like high-intensity discharge (HID) headlamps with signature LED light, 19-inch Satin Gloss Granite wheels, Satin Gloss Granite grille surrounds, Uconnect 8.4-inch infotainment center with navigation, tungsten interior stitching, Gloss Black roof and deep-tint glass, LED tail lamps, and anodized gunmetal interior finishes. Are there many ways to customize the 2019 Jeep Compass? Jeep is one of the most popular choices for customers who want a uniquely customized vehicle that suits their personality. The Compass is offered in four trim levels including the Sport (4x2 and 4x4), Latitude (4x2 and 4x4), Limited (4x2 and 4x4), and Trailhawk. There are three appearance packages. The Sport is offered with the Upland Appearance Package, the Latitude is available with the Altitude Appearance Package, and the Limited can be equipped with the High Altitude Appearance Package available on Limited. There are many great paint colors that can be chosen, like Redline Red Pearl Coat, Granite Crystal Metallic Clear Coat, Bright White Tri-Coat, Jazz Blue Pearl Coat, and Olive Green Pearl Coat to name a few. The interior color options include Black and Sandstorm, Trailhawk Black, Black, and Black/Ski Grey. Can you tell me more about the Trailhawk model? The Trailhawk model is the ultimate choice for drivers who want to take their Compass off the road and into the mud. It boasts Trail Rated 4x4 capability, 34-degree departure angle, 30-degree approach angle, and 24-degree breakover angle. 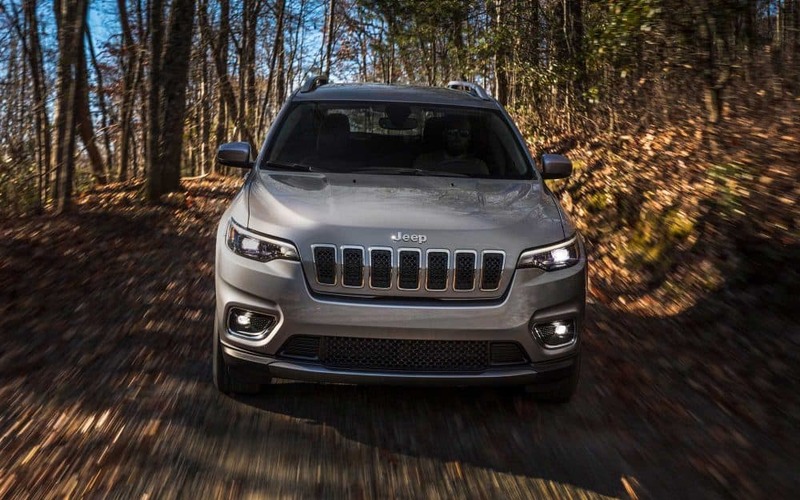 The Compass Trailhawk has Jeep Active Drive Low 4x4 20:1 crawl ratio, 17-inch off-road tires, up to 19 inches of water fording, skid plates, and an increased ride height. There are many reasons to be excited about the 2019 Jeep Compass. This vehicle is remarkably capable, versatile, and offers an unmatched off-road performance. If you have any questions about this outstanding vehicle, contact us today at Speedway Chrysler Dodge Jeep Ram!